3 Bedrooms, Den, 3.5 bathrooms, Sleeps 6, Guest Quarters, Gated Community. Located in the famous Boulders Resort is this beautiful 3800 Sq. Ft., 2007 Sante Fe Style 2 story home. You will enjoy the quiet surroundings in a secluded cul-de-sac- neighborhood. The lower level offers 2 master Suites with king size beds, Den/Office with sofa, designer Kitchen, Breakfast Room, Great Room with gas Fireplace, Formal Dining Room, Powder Room, Laundry Room, equipped with Washer/Dryer and utility sink. Both inside and out are beautiful flagstone flooring. Upper level is the separate Guest Quarters with 1 queen size bed, walk up bar and deck with Mountain and Sunset Views. Fenced back yard living area includes available heated pool and spa with water falls, gas BBQ and fire pit. Home includes Gas Fireplace, Phones throughout the home, central Air conditioning/Heating, 4 TVs with Cable, Stereo System including rear patio speakers, fax machine, fully loaded gourmet kitchen and all linens. Kitchen Description: Kitchen is fully loaded with 2 ovens, built in microwave, built-in luxury Refrigerator with ice maker, warming drawer, high end 6 burner gas cook top, dishwasher, filtered water faucet, soft water throughout the home, built in kitchen desk with fax/copier, walk in pantry, granite counter tops, island with bar stool seating and anything you would need to make a gourmet meal. Out door living area: The unique outdoor living area provides flagstone decking, gas BBQ, gas fire-pit and beautiful pool/spa. In the mornings have your breakfast on the patio table listening to the water fall and fountains from the pool. In the evenings enjoy the strategically placed low voltage automatic lighting placed around the property. Please call or e-mail to inquire about this beautiful home. Owners designed and built this fabulous custom home. Attention was placed creating an open common area but providing maximum separation between all three bedroom suites. Our property is located within the Boulder Resort with nearby access to one of 4 major resort entrances and on a low traveled short cul-de-sac with no adjacent neighbors. The rear yard faces south for perfect winter and summer time orientation. Downtown Carefree and Cave creek offer many shops, restaurants and bars to choose from. only 10 to 15 minutes away. World renowned resort and golf courses. Please review the Boulders web site for golf information. Mountain views from great room, second floor deck and rear yard. Pool area is not fenced in for Children but does have a door alarm from house to pool area. What a wonderful place to stay! The house was absolutely gorgeous and very comfortable, the kitchen was well stocked, the spa with the gas fire pit right next to it was so wonderful after our long day of hiking, entering and exiting The Boulders was very easy, great location in Scottsdale near any store you might need, near fantastic golf courses (The Boulders South course and Troon North were amazing!) and hiking trails (Tom's Thumb and Pinnacle Peak were two of our favorites! ), and truly perfect for our family vacation with our two adult children...each getting their own bedroom with their own bathroom. We appreciated David checking in with us to make sure everything was going well and was always quick to respond to questions. It was a fantastic week stay and we hope to get another opportunity to stay in this beautiful home! Hi Kellie and thank you for your wonderful review. It was our pleasure to have you as our guest and we look forward to your return. David. Thank you Kathy for taking the time to review our property. I know future guests will come away with a similar feelings. We have stayed at the house before and love it. There's nothing not to love about this house. My wife and I and our guests had a great time. The location is great and the pool is awesome. Thank you Tom... We appreciate your review and look forward to your return. Have a great summer! Recently returned from a stay at this residence located in the Boulders community. Everything was as promised and the house was well located, clean and comfortable. David was available and responsive if necessary. 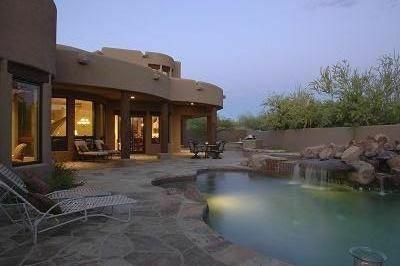 If you are a fan of the desert environment would recommend this property without hesitation. Thank you for your review and we appreciate it very much. Have a great summer and see you soon. The home was just as we remembered it from 2012. It's still well maintained and clean. David and his wife Gina were very attentive and accessible. We enjoyed their home tremendously. We grilled while lounging at the pool. We also enjoyed great restaurants such as George & Sons, White Chocolate and Ruth Chris. Took in plays, comedy shows, a spa day at the Sanctuary Camelback Mountain Resort & Spa and of course shopping! This is our home away from home...a place to get away from it all. It was twice as nice as the 1st time we we're here in 2012. Thanks again David and Gina for the pleasure and comfort of your home. Thank you Terry for your review. Gina and I are very happy that you guys had a great time. Hope you have good rest of your summer. See you soon! * Owner will include up to $300 per month for utilities or $75 on a weekly rental (gas and electricity) for our utility fee (gas meter pictures and monthly electrical bills are used to calculate utility fees). Cleaning fee required depending on how long the stay $225.00. min. with additional cleaning based on length of stay. Security Deposit required $500.00 (refundable minus any utility fees required). Please inquire for rental rates during holidays.